The current Cook the Books selection, hosted this time by Simona of Briciole, is The Cooking Gene, by Michael W. Twitty. I've known of Michael W. Twitty for several years. He is an African-American, Jewish food historian and chef who hails from the DC area where I live, and who has been doing truly interesting work recreating the experiences of early American cooks in authentic kitchens located at various historical landmarks. As a researcher and teller of stories, he has focused a lot of his attention on tracing the path of foods as they have migrated over the centuries with the people who ate them, particularly those whose journeys were against their will as slaves or refugees. Those stories are the hardest to research, because the chain of ancestral storyteller to listener is so often forcibly broken. Through the path of food as it travels from one area to the next, Michael Twitty's work seeks to reconnect those broken links. Sticky notes of possible recipe inspiration! 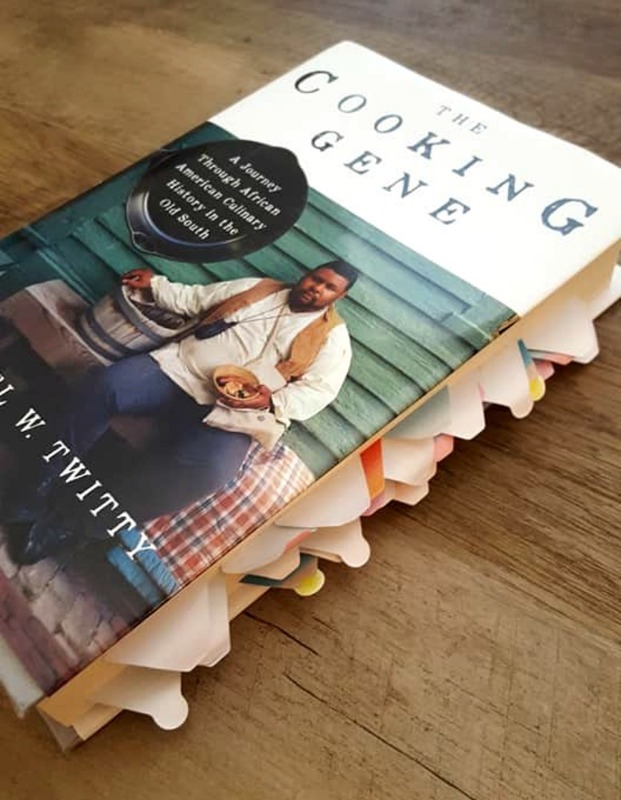 The Cooking Gene is equal parts history, food writing that will make you curious to try things you never have, nostalgia for the foods of your own childhood, along with a good peek at history and science. You'll find yourself learning about DNA testing's role in helping solve the complexities of tracing roots as a black American. You'll be caught up in reading a personal memoir and family history that is at times funny and heartwarming and at times absolutely heartbreaking, and then seeing it set against a well researched explanation of how focus on "King Cotton" led to a legacy of malnutrition that still impacts poor black families in the south. These ingredients all come together in a book that was both riveting and very difficult to read without flinching. Go ahead and flinch - our history is extremely uncomfortable - and then keep reading. You will know much more when you finish this book than you knew before you started, and you'll find yourself thinking about it long after you've put it down. I am so beyond impressed by work that went into The Cooking Gene. But I was totally overwhelmed when it came to choosing what to cook as my inspiration from it. SO. MANY. POSSIBILITIES. 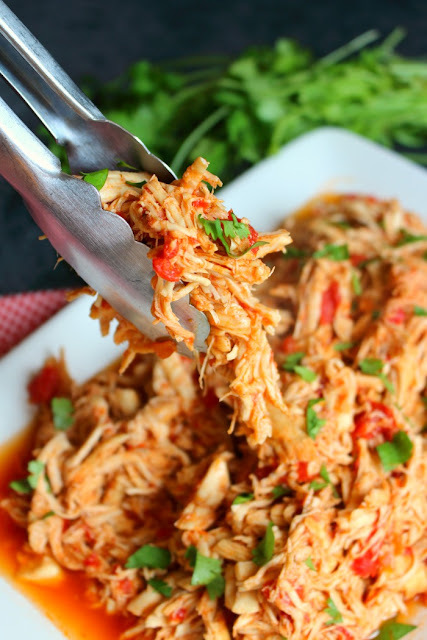 There are a few recipes included, but there were also numerous mentions of foods from the American South, Europe, Africa, Asia... name it. I decided to take my inspiration from a passage about time spent visiting his Southern relatives as a young man. In The Cooking Gene, this story includes a passage about persimmons, and it occurred to me that I had never had a persimmon, never much thought about persimmons or had any idea of what they tasted like. That same week, to my surprise, persimmons showed up in my produce box, and suddenly, I had to figure out something to do with them. 'Hours later, we would tumble into my paternal grandmother's home. "Ma, you're never going to believe this," he said, peeling back the layer of the bag. My grandmother happily said, "Oh, 'simmons!!" I took half and, under my father's instruction, made the same persimmon beer that Elijah and George toasted their freedom with in 1865. My grandmother, who used to use the unripe astringent ones in place of pimple cream, turned her 'simmons into a spicy, molasses-laced persimmon bread, drawing on a recipe from the newspaper to back up her memory of a treat that had been eaten for at least three generations.' ~ The Cooking Gene, pg 228. 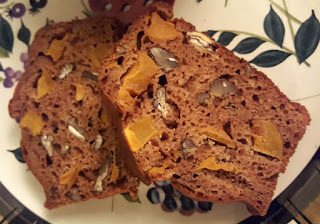 The recipe for persimmon beer is included at the end of the chapter but calls for 10 cups of persimmons and several weeks to ferment, so I wisely decided to try Persimmon Bread instead. The American variety of persimmon is Diospyros virginiana. Gee, it would have been great if I'd taken a picture of the persimmons before I cut them! What came in my box was the more commercially available Fuyu persimmon, which doesn't have the astringent qualities of other varieties, and so can be eaten while still firm. This time of year is just an excellent time for sweet quickbreads, so that's what I've done here - I have no idea if this is anything at all like Michael Twitty's grandmother's, but we enjoyed it quite a bit. The gingerbread loaf is a basic quickbread that uses molasses and buttermilk, along with roasted persimmon where I might otherwise use raisins or other dried fruits. Preheat oven to 375F. 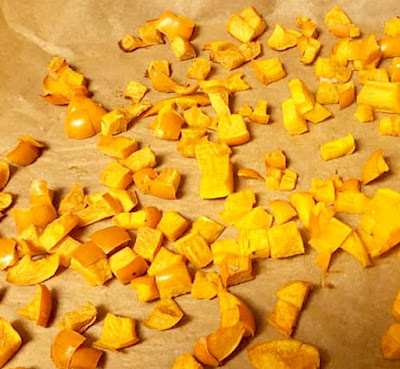 If desired, peel the persimmons (I didn't and didn't notice an issue with it) Wash persimmons, cut in quarters and de-seed them, then chop into small, dice-sized cubes. Spread persimmons on a parchment-covered cookie sheet, drizzle with oil, and roast for about 20 minutes, until they are soft and slightly caramelized. 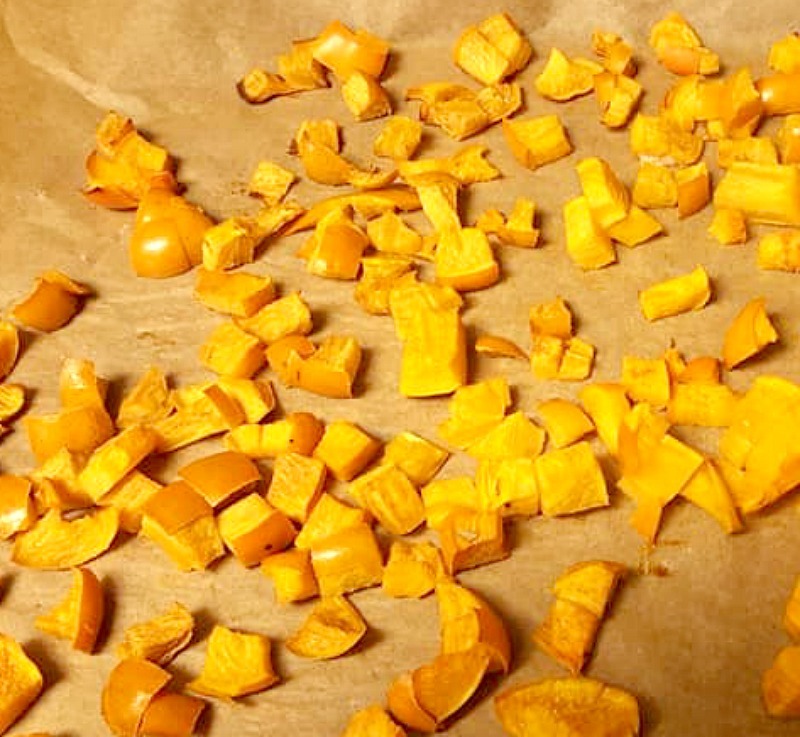 Let persimmons cool for several minutes and lower oven temperature to 350F. In a large mixing bowl, combine butter and sugar, creaming together thoroughly, then add molasses and vanilla, stirring to blend well. Add the eggs one at a time, mixing between each addition so that the batter is well mixed. 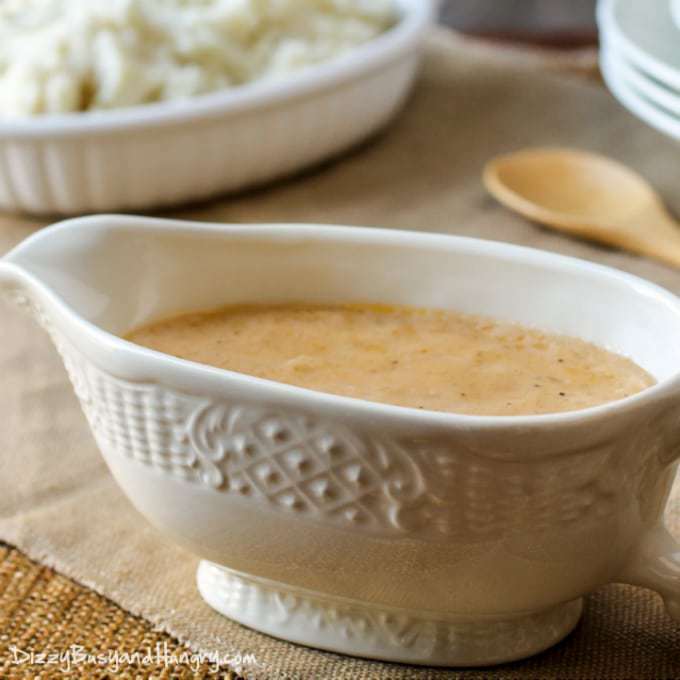 In a second mixing bowl, combine flour, soda, and spices. Add the dry ingredients, alternating with some of the buttermilk, a little at a time to the wet mixture, mixing well between each addition. Add the roasted persimmons and pecans to the batter, again mixing well to coat the fruit and nuts. Spoon batter into greased loaf pans (I used two smaller pans so I'd have one loaf to freeze for later), leaving about an inch of room below the rim. Let cool on a rack for several minutes before removing them from pans, then let cool completely before serving. 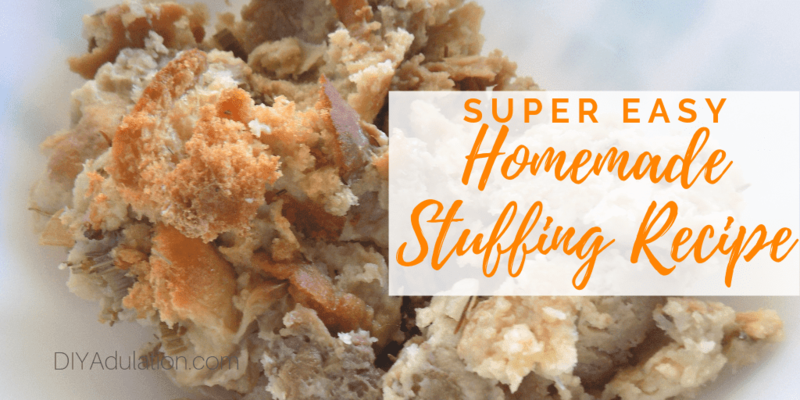 A loaf of a good quick bread like this is just right for keeping on hand for visitors, and is equally good as a fast breakfast, an afterschool snack, or a simple dessert. 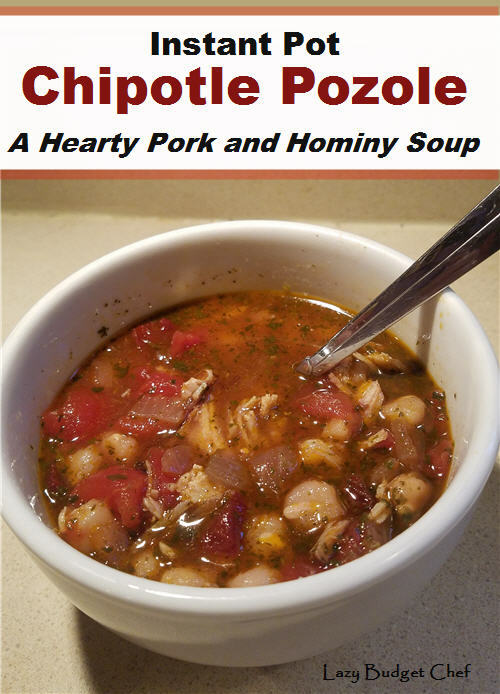 I hope you'll check in with Cook the Books to see the round up of what other inspiration bloggers have found inside the pages of The Cooking Gene! The next four book selections have been announced - maybe one will tempt you to join in! Welcome to the Party in Your PJs Link Party, where your posts will be seen on three different blogs each week. 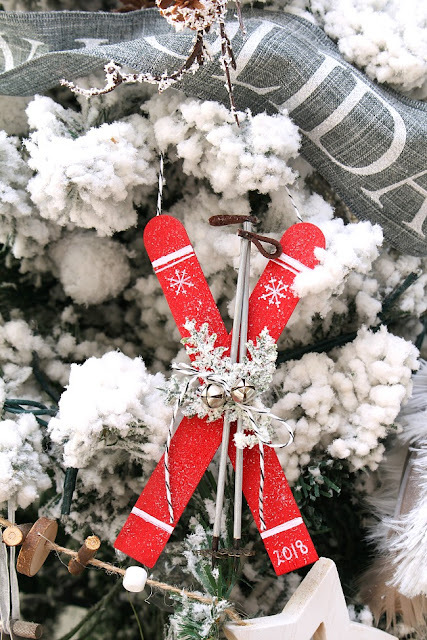 Here are a few other wonderful handmade ornament ideas! 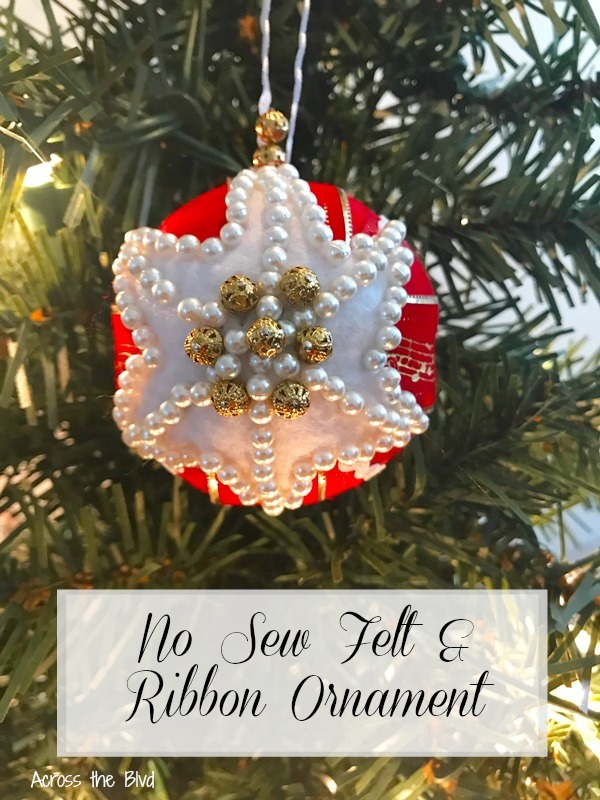 For someone that can't sew a button, or stitch a thread, I really love to find ways to be creative and even better if it's good enough to show off or gift! A few years ago I did a project I'd been wanting to do for as long as I could remember. 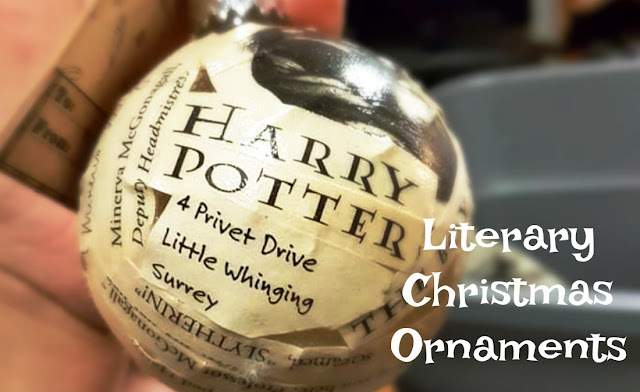 I wanted to use my original, completely falling apart copy of Harry Potter and the Sorcerers Stone in something artistic to breath new life to it. Don't worry, this paperback has been replaced by numerous copies! Even though it was completely destroyed after nearly 2 decades of love, I was reallllllly hesitant to cut it up at all. I may have closed my eyes for the first snip. 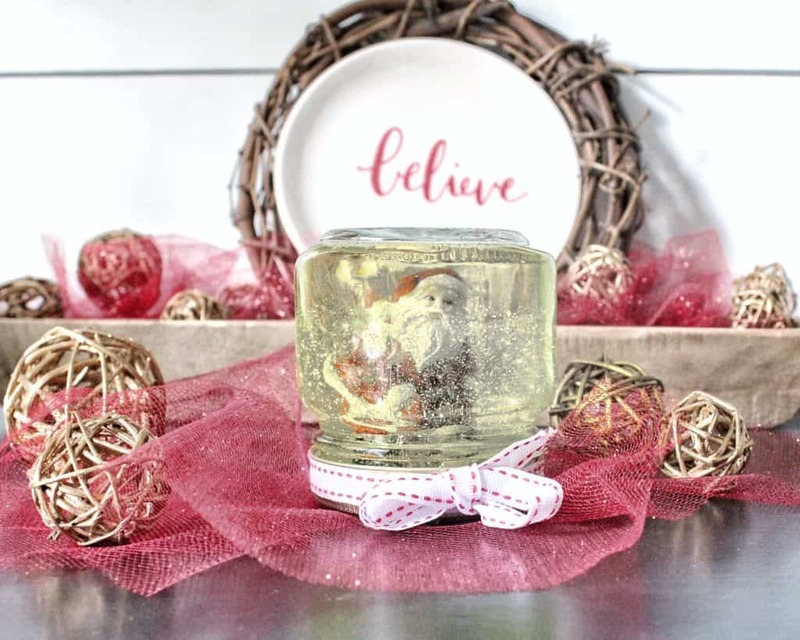 Using craft glue, Glass ornament balls and snippets of some of my favorite lines, I made Christmas Ornaments that I will treasure forever! charms/ribbons of your choice for final touches. First prepare your page pieces. I personally used favorite lines or quotes that mean a lot to me, chapter names, and even pictures on some. Cut pieces and set aside. 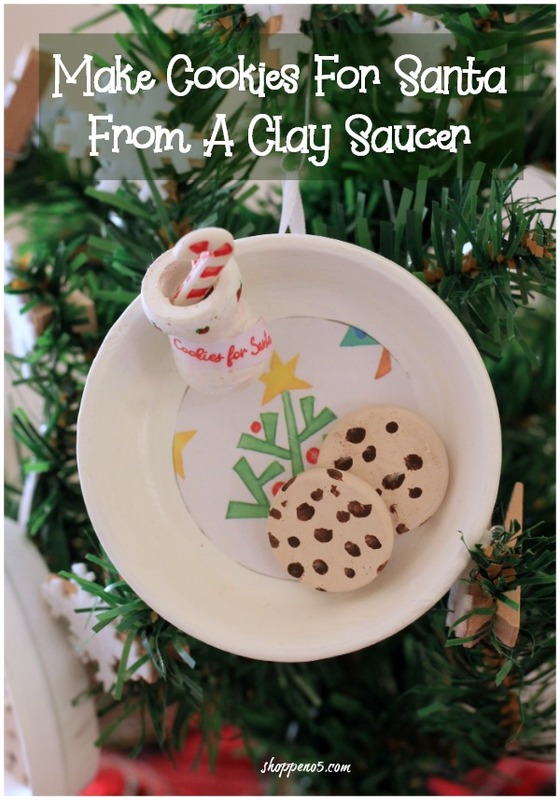 Pour Mod Podge into a container for dipping. Working one strip at a time, brush Mod Podge along the strip while straightening it out on glass ball. 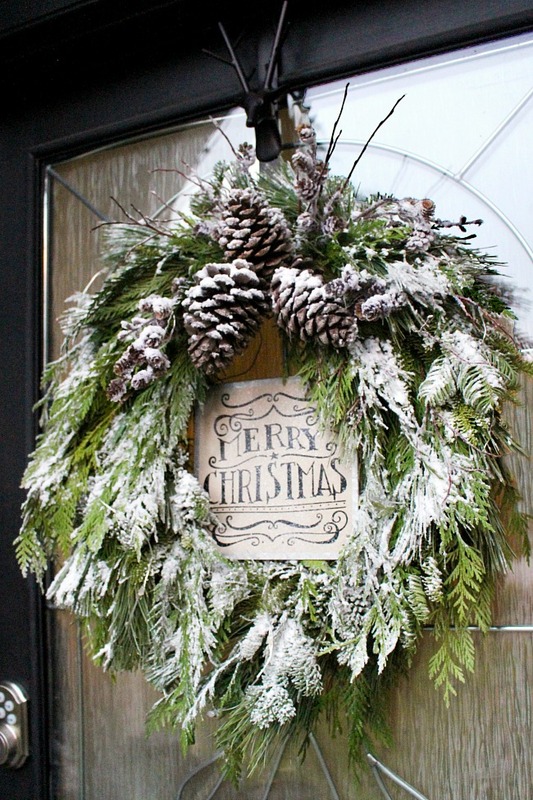 Once all pieces are assembled as desired, do another coat of Mod Podge over entire ornament. For this coat, I used a glossy version. 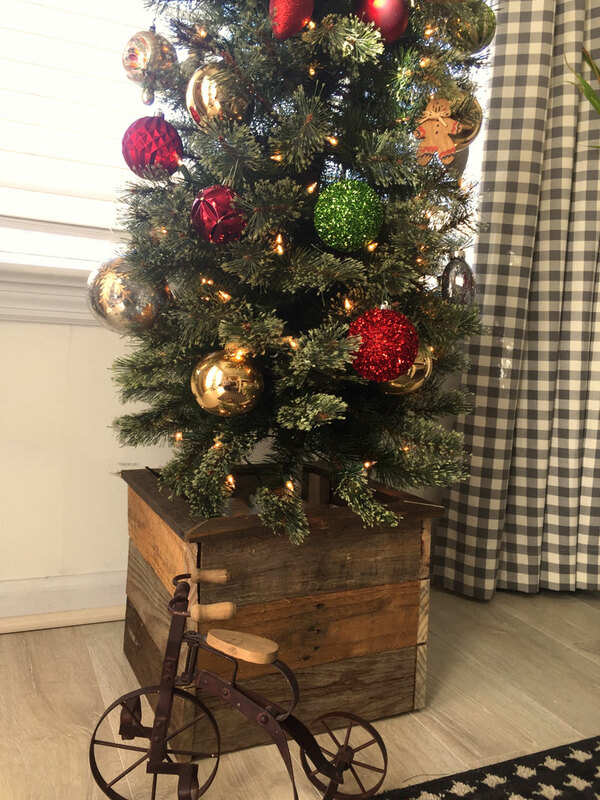 Once completely dry, add any desired decorations. 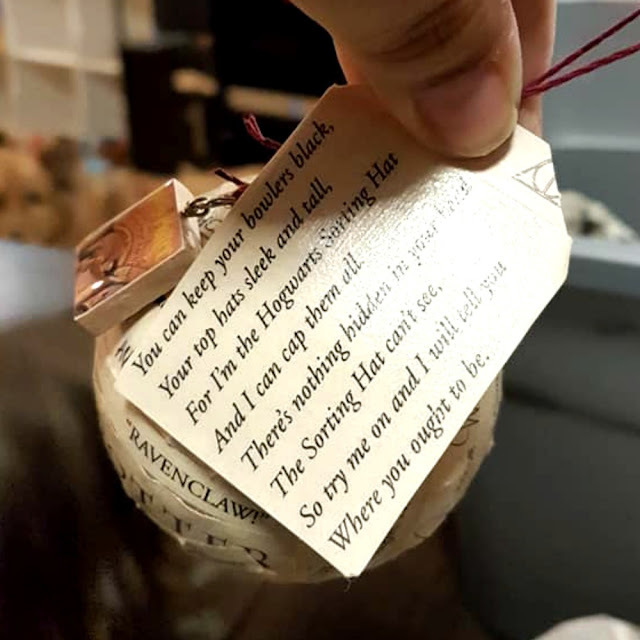 I glued a part of the Sorting Hats song to a sturdy gift tag I found, and tied it to the top of the ornament. I also had a handful of charms from a bracelet I no longer wore that went great on this! 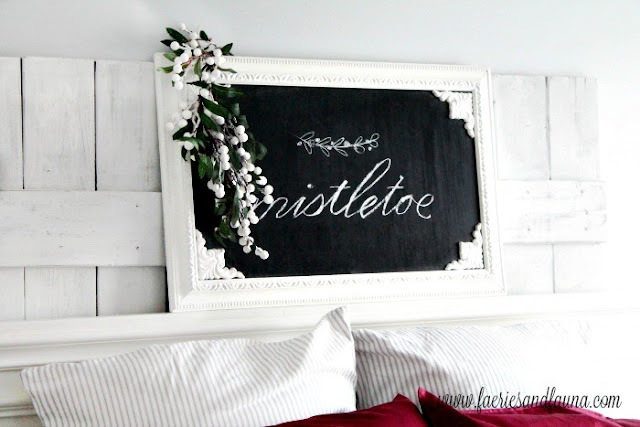 I can't wait to do this with sad copies of all my favorite books! I scour thrift shops and yard sales for this exact reason now. What do you do when beloved books are no longer readable? If you're like many, just as soon as the Thanksgiving leftovers are put away, your thoughts will turn to holiday preparation, whether it is to head out into the Black Friday fray to buy presents or to being decorating your house for the season. Here are a few DIY ideas to introduce the Christmas spirit into your home! The first time I had carbonara, I was in Paris, France. I'm not sure what the name of the noodles they used are, but they were big and fat and a bit curly. It was smothered in a creamy sauce with mushrooms and peas and bits of ham. 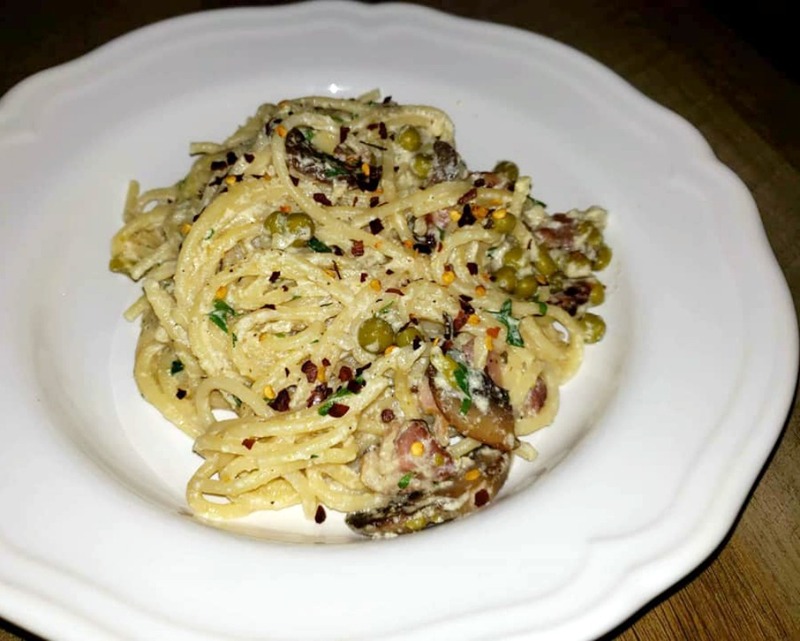 The second time I had carbonara, I was in Santorini, Greece. 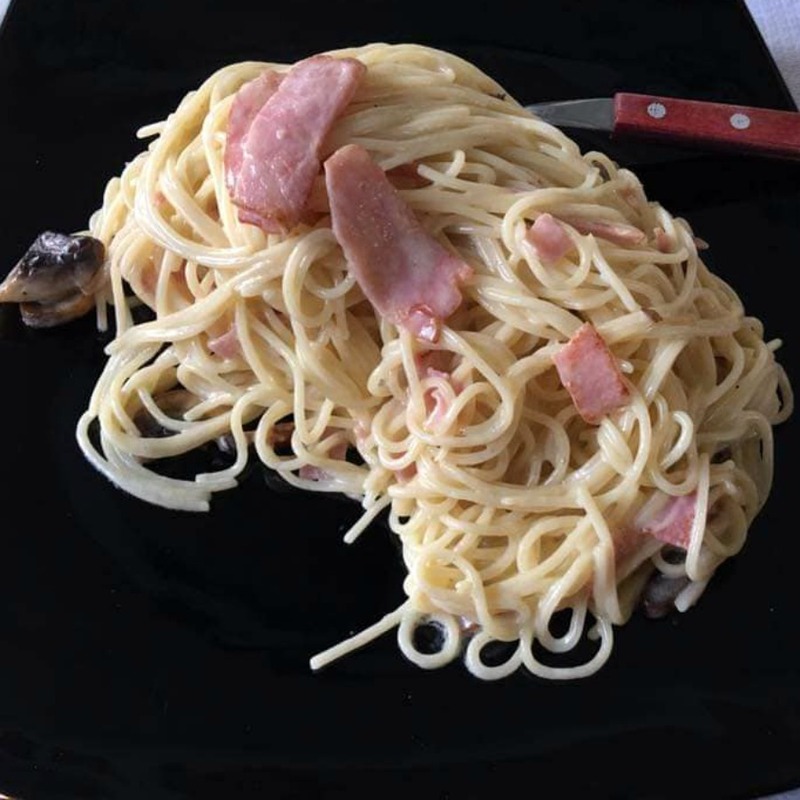 It was made with spaghetti noodles, large chunks of ham and mushrooms. The sauce was delicious but different than what I'd had previously. Instead of a soupier sauce, it was a thicker coating on the noodles. 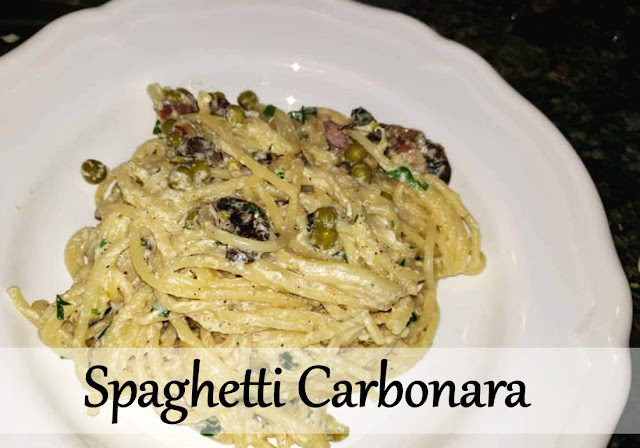 The THIRD time I had carbonara, I made it myself! I'm not one to toot my horn too often, but it is so good!!! Doing a bit of research and using bits of each past experience I dare say, I have perfected my recipe to my family's taste. Carbonara sauce is made with whipped eggs, heavy cream and Parmesan cheese. I think you can probably add whatever protein, or not, to it but it seems ham is most common - the saltiness of the meat is a part of what gives carbonara it's distinctive flavor. Personally, I prefer crispy bacon and I'd love to try it with shrimp! 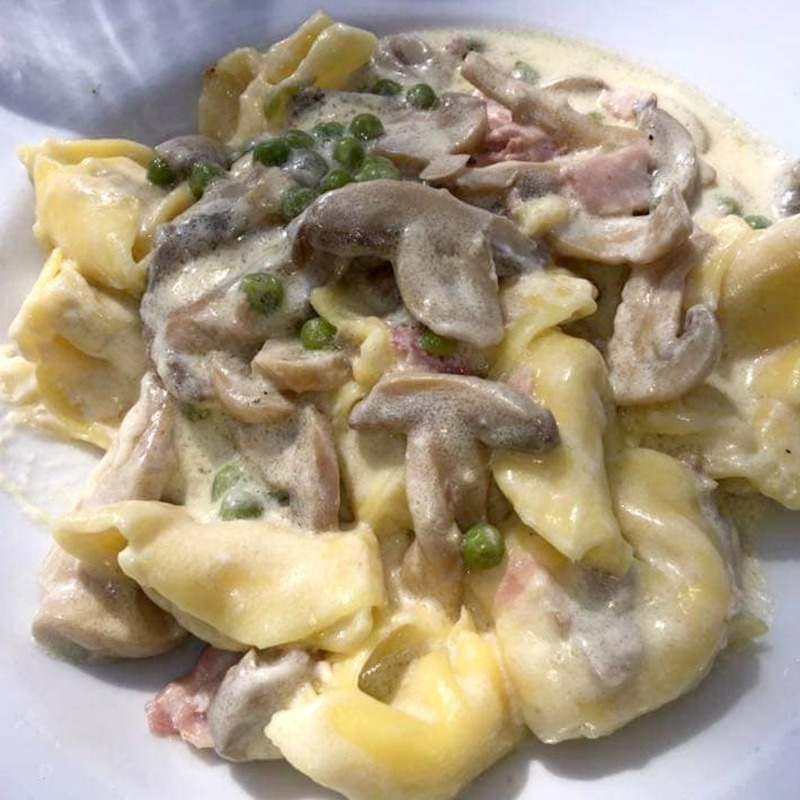 Peas, while not authentic to Italy, are a wonderful addition! I also think asparagus would taste amazing in it. Do try cooking the pasta this way - it makes them incredibly flavorful and come out a perfect al dente. Chop bacon into pieces and pan fry. Remove bacon and set aside, but do not drain the grease from the pan. Add mushrooms to bacon grease and saute. Add bacon back in, and set the pan of mushrooms and bacon aside. Whisk together cream, eggs and Parmesan. Set aside. Boil 5 cups of chicken stock and add spaghetti noodles and minced garlic. Cook, stirring often, until the noodles are al dente. 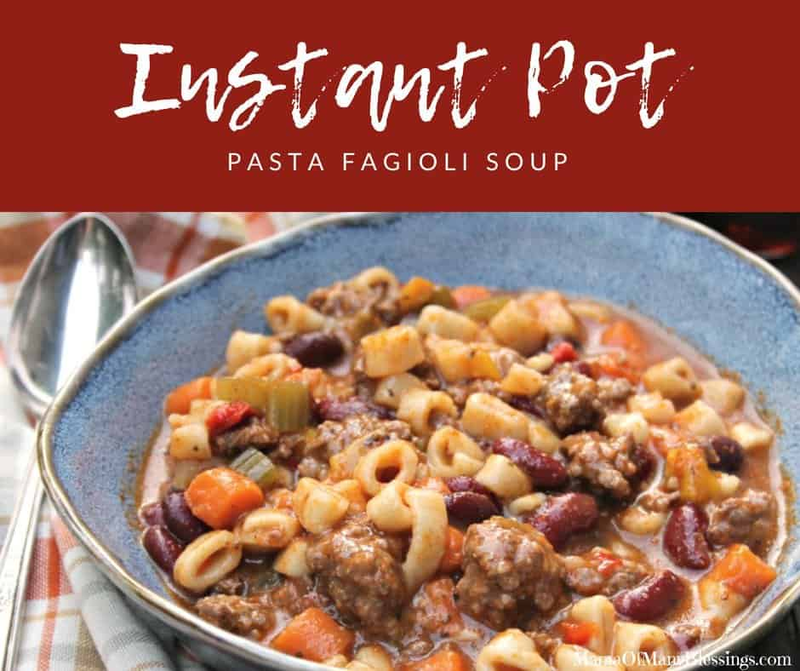 There will be about 1.5 cups of liquid left in the pot once pasta is cooked. Lower temperature to medium without draining the pot. (If you want a drier coated noodles, feel free to drain the pasta.) 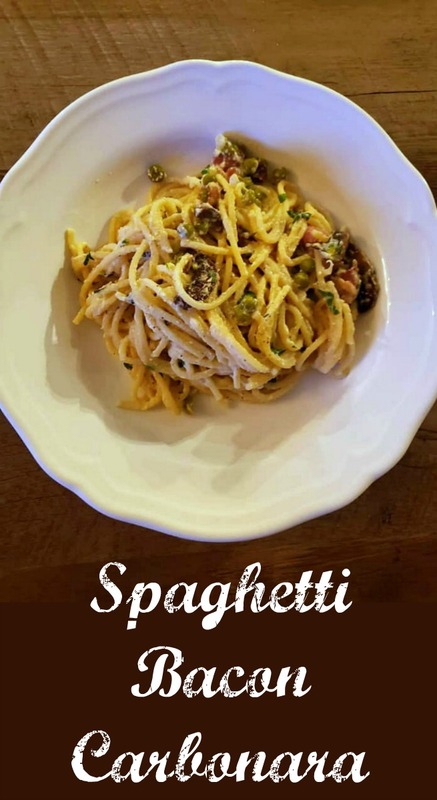 If you'd like it a bit creamier, keep the broth and pasta in the pot and SLOWLY add egg mixture while stirring (otherwise you might get a scrambled egg situation going on). Add in the bacon and mushrooms, the drained can of peas, and the chopped parsley, stirring to combine. For even more flavor, sprinkle red pepper flakes over the top to serve. 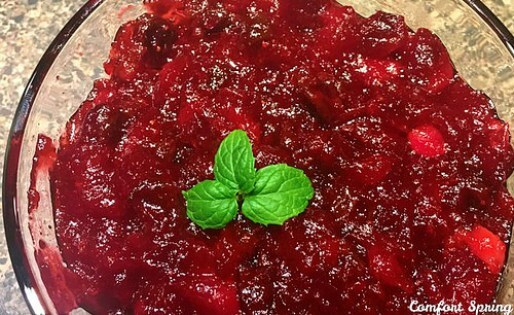 While the turkey takes center stage on most Thanksgiving tables, delicious side dishes that aren't overly complicated make the meal a feast! 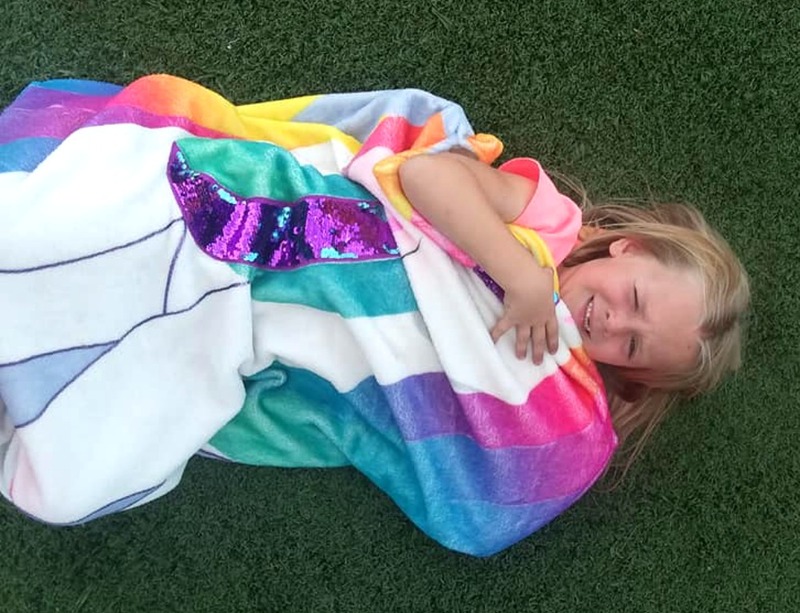 So, there's a fun company that was featured on Shark Tank awhile ago called Luvsy that has come up with the cutest little blankets and sleep sacks for little girls that I have ever seen! They are so soft, double sided with a design on each side and the inside is so cozy, you could easily curl up and take a nap. 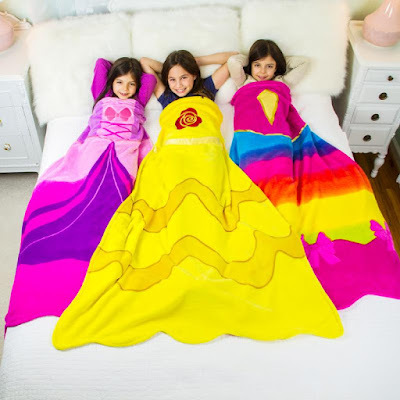 The Princess blankets come in designs geared towards the pretty little princess in your life. One in Lively Yellow (like Belle from Beauty and the Beast), Perfect Pink (which reminds me of Aurora from Sleeping Beauty), Rainbow (which is well, a rainbow dress) and Brilliant Blue (but of course, like Cinderella or even Elsa from Frozen). 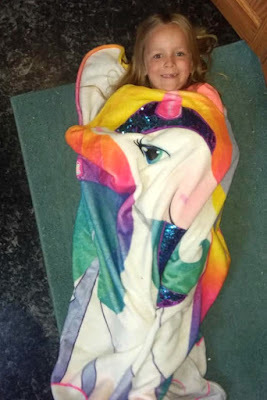 They also have a Unicorn sleep sack! 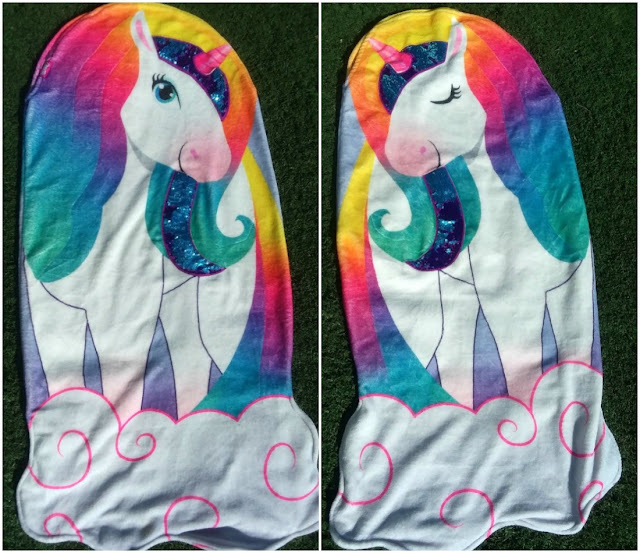 I was given the Unicorn sleep sack to review and unless you live under a rock, you know how popular Unicorns are right now! My 5 year old daughter almost had a panic attack when I pulled it out and showed her. She screamed and begged me to let her sleep with it right away. I gave in of course and she carried that thing around everywhere. On one side of the blanket, there is a happy open eyed Unicorn. On the other side is a closed eyed sleepy Unicorn that we obviously used at bed time. This review took me a while because, well, I could not tear this thing away from my daughters. They would constantly fight over it and I had to designate days that one could sleep with it and the next to the other sister. Between the two of them fighting and sleeping with it, I had to wash it (twice). This blanket held up so amazing in the wash. I did not machine dry it, but hung it on the clothesline. I am not sure how it would hold up in a dryer because there are sequins scattered over the blanket where the Unicorns hair (mane?) is. It would probably be fine - I just haven't tried it. Either way, the clothesline worked fine for us and there is no sequin out of place after weeks of constant love. I cannot even tell you how much I recommend this product for the little girls in your life. Be it your daughter, niece, or granddaughter, you will be the BEST! The Unicorn sleep sack costs a mere $34.99 and a really cool thing that they do is size it by age. 3-9 years old get one size, while ages 10+ get a bigger size. The Princess blankets cost you $29.99. Shipping is free for orders of $50, so get two! 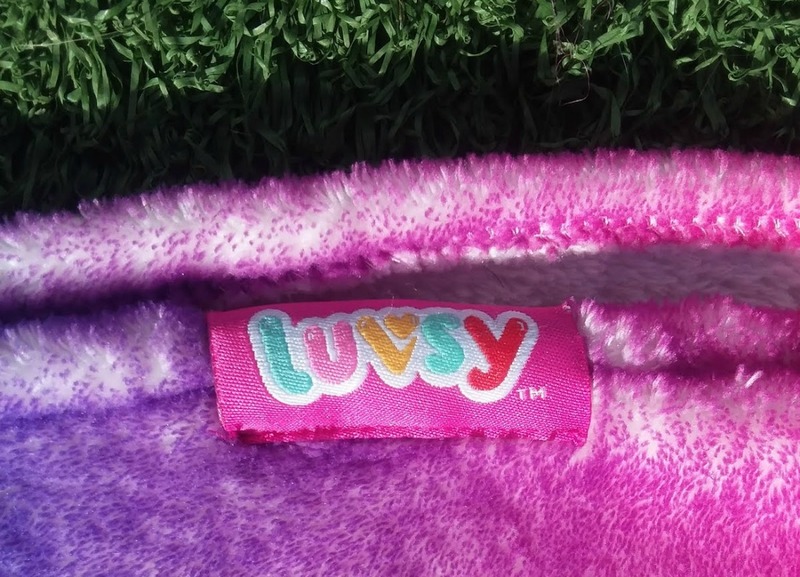 Luvsy also regularly gives away blankets to specific shelters and hospitals around the country, and you can read up on who they're currently sponsoring on their Giving Back page. According to their FAQ, they can also work with schools and organizations to provide products for fundraisers. I am so impressed with the quality and designs on this product. I would definitely tell all my friends and family with little girls that they should check this company out!! During the first nearly two years we've owned an Instant Pot, we have made plenty of amazing meals, many of which surprised me that they could be done so well in the appliance. 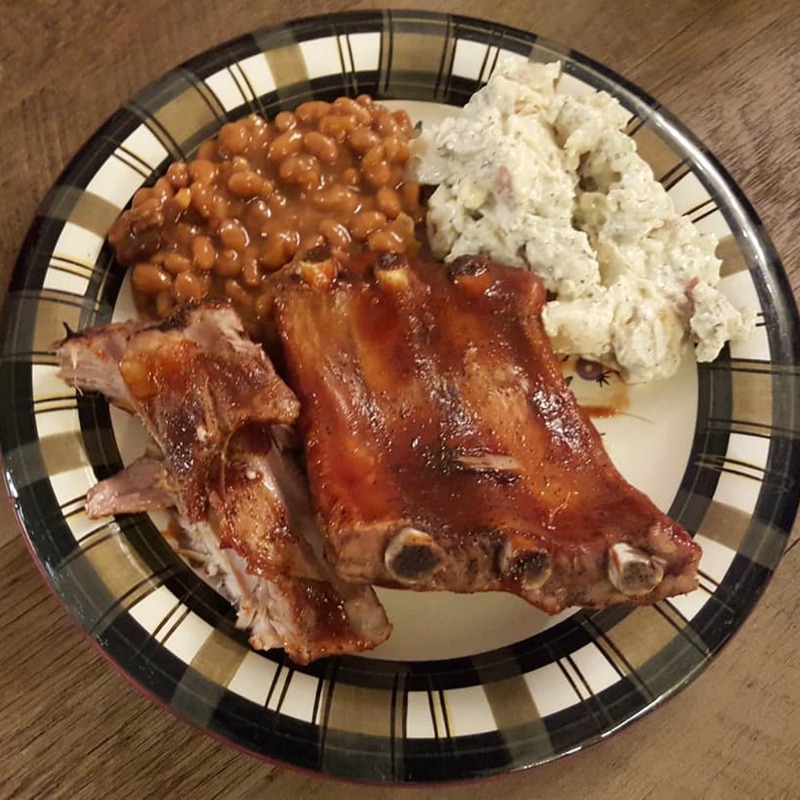 One meal my wife had suggested numerous times was a rack of ribs. Ribs are among one of my favorite foods and something I often order whenever given the chance at a restaurant. 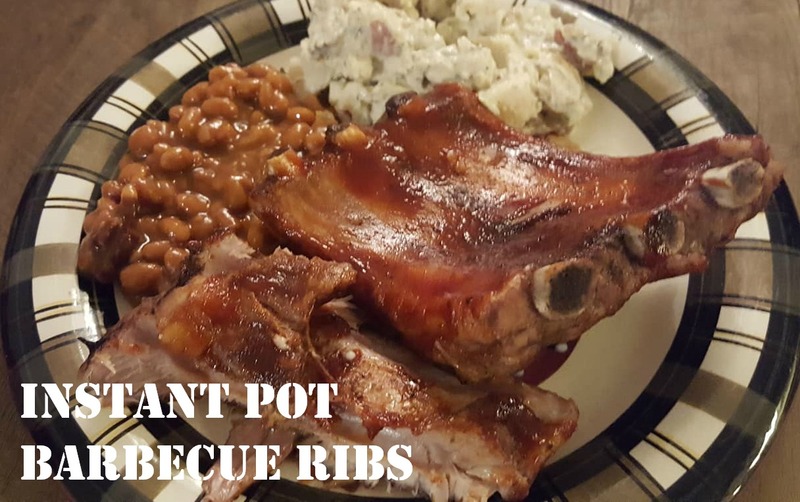 I had attempted them at home once or twice, both in the oven and on the grill and while they were okay, they weren't a great outcome for what ribs tend to cost. Also, they took a good long while, so it was a more rare treat. 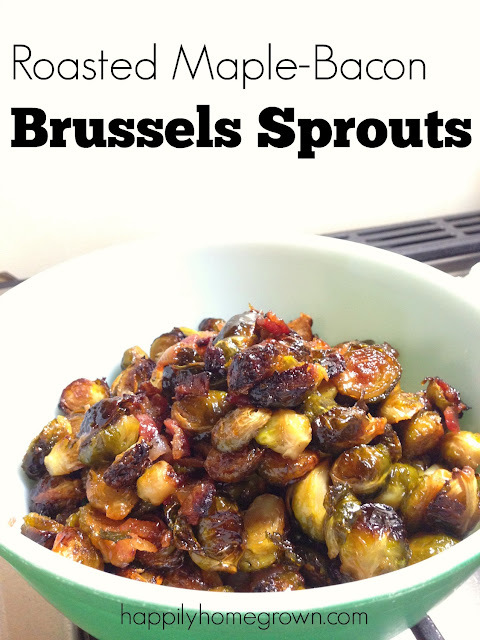 I was extremely hesitant about trying to quick cook them and wasting the meat. Eventually, I gave in and let her look up the suggested cook time, while I ran with the recipe. At this point we've done them in the IP, and no other way, nearly a dozen times without fail. 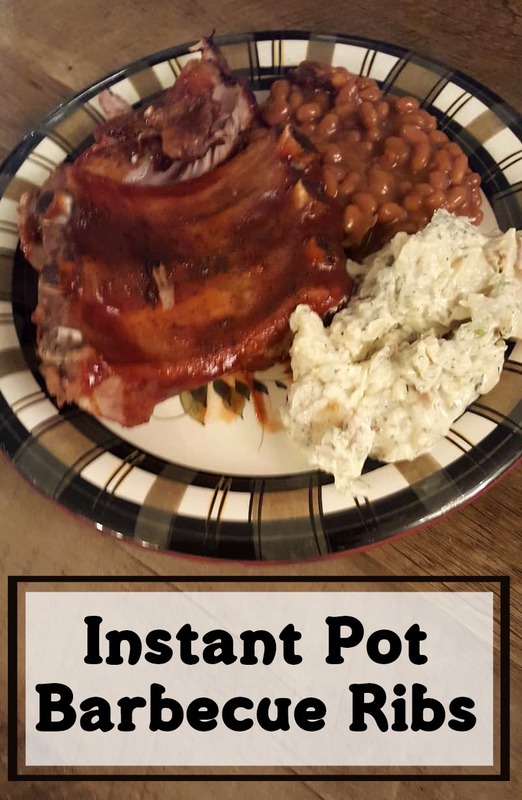 If you want fall off the bone, delectable ribs done in a fraction of the time, do your self a favor and try this recipe sooner than I did! Curl the ribs around the inside of the Instant Pot. Carefully remove the white membrane from the back of the ribs. Dry ribs well. Rub desired amounts of each dry seasoning onto both sides of ribs. 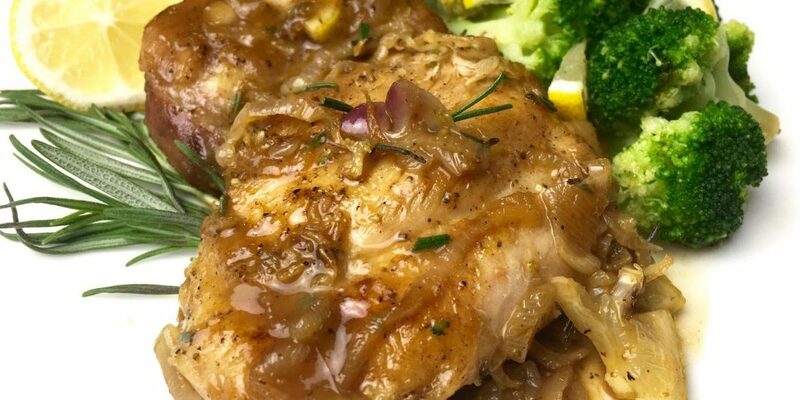 Pour chicken stock and liquid smoke in bottom of the Instant Pot liner. 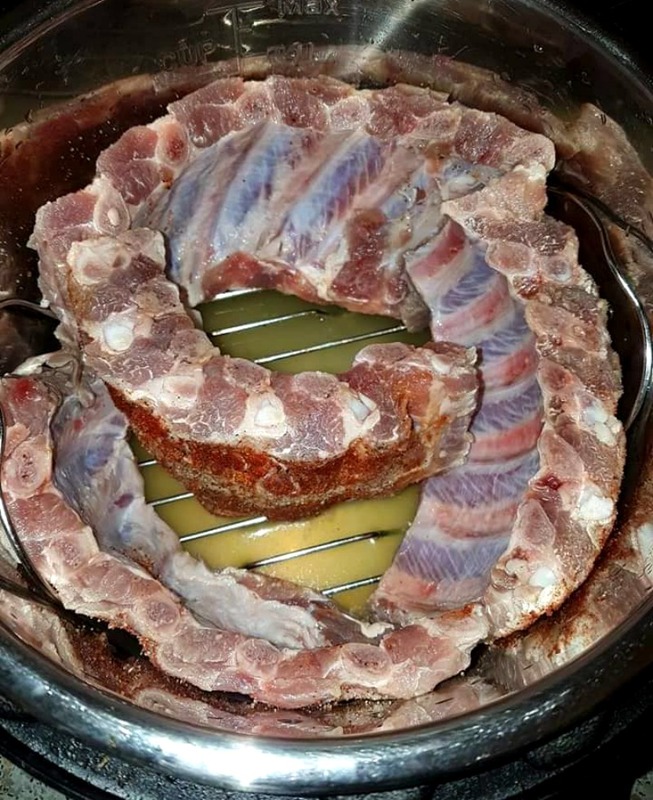 Curl ribs around inside of Instant Pot liner, on top of trivet. Cut ribs smaller if need be. Cook on Manual High for 35-40 minutes. 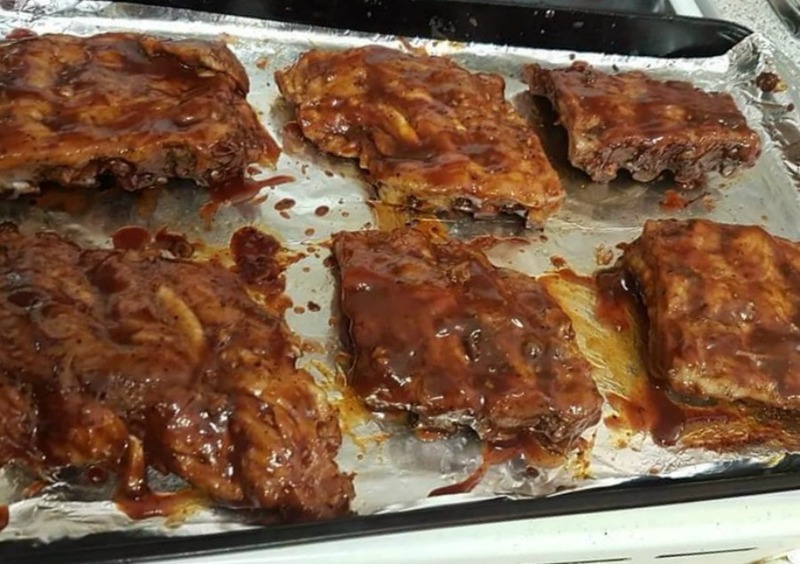 Place ribs on a foil lined baking sheet and brush with your favorite BBQ Sauce. Broil ribs for just long enough for sauce to get tacky. Flip ribs over and repeat on other side. These succulent ribs go great with baked beans and potato salad. Try them once, and I bet they'll be a family favorite at your house, too!